Know it’s been awhile here, but here’s a new update on my Hans from Holland column. Yes, just at the end of this year, well let’s say; saved by the bell… Things are goin’ well here in Holland, finally we’ve had a white Christmas, the snow get us from the street into our sheds to build and wrench on our projects. A few weeks back the latest issue of the dutch XS 650 magazine, the 653, fell on the doormat of every XS freak in Holland. Again of course chock-full with all kinds of XS twin stuff. As you see in the Andy Warhol style cover we’ve paid lots of attention to the 40th birthday of our beloved twin. It was exactly on 24 October 1969 when the XS-1 was introduced at public and press at the Tokyo Motorshow. You thought the landing of the Apollo 11 was the biggest news in ’69?…hahaha. Anyway, this edition of the Tokyo Motorshow was visited by 1,5 million people. The first four-stroke of the best selling two-stokes company was a fact and everyone was wondering how thay came up with such an old styled vertical twin. Finally, Honda just opened the super bike time period with the CB 750… But especially in the U.S. it became a big hit, the XS was a good competitor with the Bonneville. Yamaha made a good move while the market on small two-strokes was shrinking. Best PR for the XS twin were the victories of Kenny Roberts of course, with his big bore XS in the dirt-track C-class. By ’75 the XS 650 (B model) was the best selling bike in the U.S. By the way, I got myself a ’75 B model in very good and original condition. Anyway, the latest 653 also included a nice poster of the ’69 XS-1, the green granddad as we nicknamed him. 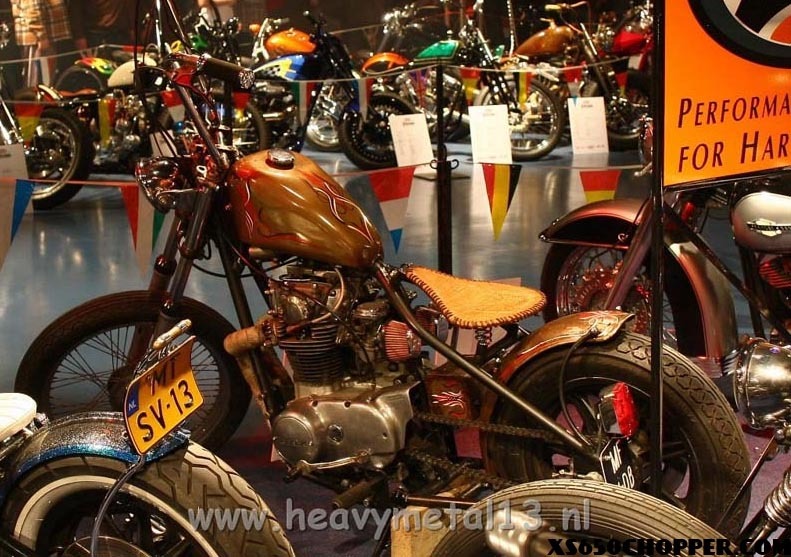 Every year in November the dutch custom-magazine Bigtwin organizes a big customshow in Rosmalen. 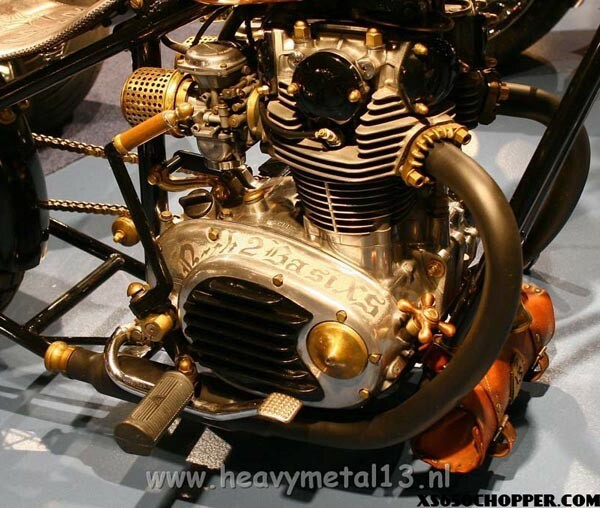 This year there were about hundred participation’s at this Holland’s hughest customshow. Of the hundred bikes were three XS 650’s. Tjeerd from Shortcut Choppers brought his nice XS bratty, this guy build really great bikes, often based on SR 500, but also on XS twins as you see. Check his site for some more radical stuff! 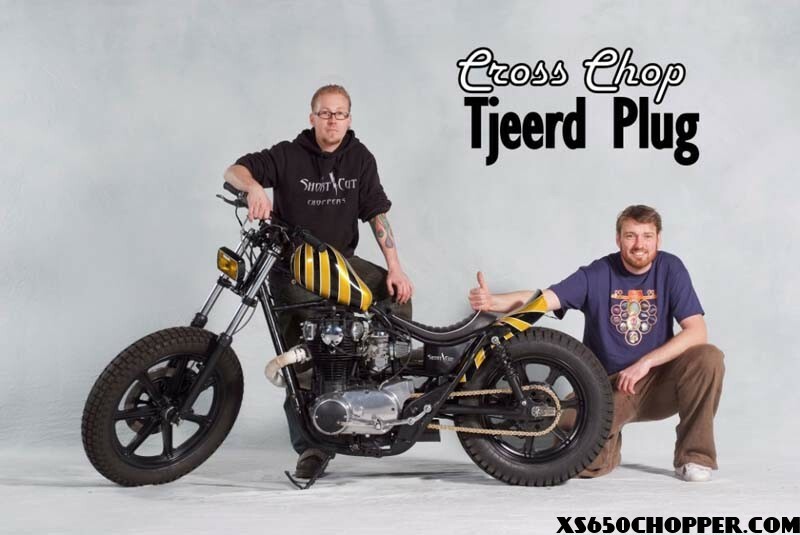 Also Sjoerd, well-known here under his nickname Weed, rode in his XS chop and showed the thousands of visitors the fun of really low-budget building. Third XS was my own Back 2 BasiXS bobber which you’ve seen here already. We had a lot of fun that weekend, met a lot of old friends, made some new and did petroltalk all weekend. Here you see our bikes and some details. Special thanks to Floris Velthuis and Heavymetal13 for the pics. That’s it for this year, in a neXSt column I’d like to show you all the XS 650’s at the latest edition of the Mooneyes Customshow in Yokohama. Meanwile a happy new year and keep the shiny side up !!!! Great pictures! I got to see more of your bike! Great detail! Your bike is awsome Hans!!! Merry Christmas (Late) Hans. Or do you say God Jul? I never get tired of staring at your bike Hans. The brat style shortcut bike is pretty cool. I think I saw some pictures of Tjeerd building it. “at our newyearsdrink” New years party? The 650 is bullet proof !!! Great bikes and really great links. gives me alot of new ideas and I’m not yet finished with the old ones. Really like the Cross Chop.